You bet you’ll enjoy a rocking ride. Can your nerves take the action of this true 4×4 adventure ? Easy money – only a Hummer® can guarantee a winning hand. An introduction to Sedona’s spectacular scenery, amazing rock formations and the natural spelendor of this magical place. We’ll introduce you to our favorites..or you can let us know what you’d like to see! Let this hour introductory tour be remembered as a lifetime memory! Enjoy incredibly scenic views as you travel mild but fun trails along the base of the Red Rocks. Makes a great sunset tour with departure schedules determined by Mother Nature. Travel back in time on this rugged and historic trail, the same one traveled in the dark of night by the Bootleggers and Moonshiners feeding the hearty thirst of the miners in Jerome. This is for the thrill seeking individual wanting a Sedona experience like no other. This will be the most unforgettable experience of your vacation. Our trail is the most extreme 4×4 tour in Arizona, offering many blood pumping obstacles to conquer while enjoying the majestic Red Rock Canyons. A special trip through eons as you ascend 2000 feet above Sedona through a unique geological time capsule. A primitive trail not fit for man or beast — but for a Hummer® — piece of cake ! Hummer Driving Adventure YOU DRIVE !! 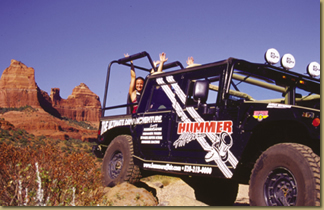 Imagine yourself behind the wheel of a Hummer H1 or H2: Navigate the most extreme terrain Sedona has to offer under the guidance of a professional driver in the most serious 4×4. Conquer obstacles, ascend canyons, travel through washes and view spectacular scenery. An affair to remember from your vacation in Sedona.